Da Capo Press, 9781560254584, 560pp. 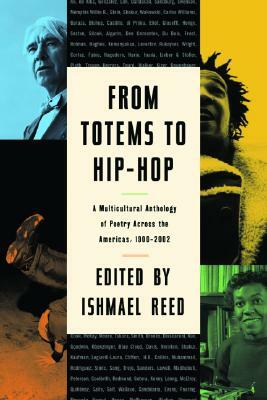 Celebrated novelist, poet, and MacArthur fellow Ishmael Reed pushes the boundaries once again in the publication of From Totems to Hip Hopa truly all-inclusive multicultural anthologya literary event which will finally even the playing field. This important collection synthesizes and presents broad swaths of work from poets of all races and backgrounds, as only Reed can, ranging from Gertrude Stein to Ai, from Bessie Smith to Askia Toure, from W. C. Handy to the little-known poetry of Ernest Hemingway. Through his unique position in American letters, as writer, teacher, and even publisher, Reed has an unparalleled working knowledge of many of the more marginalized voices in American poetry. This collection will reflect that unique access by including acknowledged masters as well as lesser known talents in greater variety than any previous anthology. From Totems to Hip Hop will cover American poetry from its pre-Columbian origins to the hip hop lyricists of today and, with the guidance of Reed's thoughtful and provocative introduction and headnotes, trace the remarkably rich cross-pollination which has continually occurred across racial and cultural lines.